Originally published on Torontoist on November 17, 2011. Part of the press preview festivities. As we approached the seating area for a press conference about the Royal Ontario Museum’s next major exhibit yesterday, we were greeted by a man in blue body paint and a tall headdress wielding a weapon. While he was there to pose for the media (and is pictured above), we couldn’t resist letting our imagination run free to speculate that he was on hand as a ghost of a past civilization warning us of future calamity. Along with the ROM’s recently reduced admission prices, it probably won’t hurt the museum’s attendance figures that the Maya: Secrets of their Ancient World exhibit that opens to the public this Saturday ties into the hype surrounding the Mayan long-form calendar prophecies—ones that some believe spell either glory or doom for the world next December. Funerary mask made of jade, shell, and obsidian, circa 250-600 CE. Royal Ontario Museum. The exhibition is a collaborative effort between the ROM, the Canadian Museum of Civilization (where it will run later in 2012), and Mexico’s National Institute of Anthropology and History (Spanish website). Over 250 artifacts ranging from giant incense burners to rings for ball games have been gathered from the ROM’s collection, various museums in the Yucatan, and institutions from overseas (British Museum) and across the street (Gardiner Museum of Ceramic Art). Many items, especially those recently excavated from the ruins of the city of Palenque, are being presented in public for the first time. Installed in the basement Garfield Weston Exhibition Hall, the exhibit is divided into seven sections covering various aspects of Mayan culture: The Maya World, The City, Cosmology and Ritual, Writing and Timekeeping, The Palace, Death, and Collapse and Survival. We were particularly drawn to the Writing and Timekeeping section, especially the exhibits on the efforts to decipher the glyphs that are the written legacy of the Mayans. Videos and touch-screen panels explain how researchers have determined that the symbols often represent syllables instead of individual letters or whole words. Like the rest of the exhibit, this section includes recreations of objects on display so that the visually impaired or those who enjoy a tactile component as part of their museum experience can touch the items without damaging the originals. This section also addresses the stories around 2012 and the Mayan calendar, including a projected clock on the wall. The ROM is also offering numerous tie-ins to the show, including a lecture series, graphic novels, and a Maya-themed sleepover for kids. As part of the press conference, we were served samples of Mayan-themed dishes that will appear on the menus of both C5 and the Food Studio Cafe during the exhibit’s run, including some rich hot chocolate. No toasts to the upcoming apocalypse, though. Bonus Features: Loblaws, Cinesphere, and OSAP, Oh My! It’s been a busy week-and-a-half for me on the writing front: a trio of stories set (mostly) in Toronto for TVO. Because after a holiday break, you need a good kickstart to get back in a regular writing groove. Not everything I find over the course of my research for these kinds of stories can or should make the final cut. So, where appropriate and time permitting, I’ll share with you the scraps from the cutting room floor or the side material that’s too good not to post. Read the TVO article, published on January 15, 2019. Toronto Star, October 7, 1920. 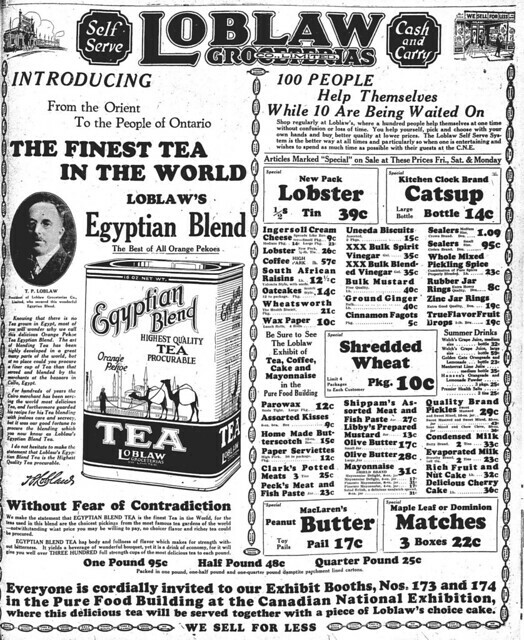 The earliest Loblaws ad I found, when the chain opened its third store, which shares the current address of St. Lawrence Hall. Toronto Star, August 26, 1926. Click on image for a larger version. Within a few years the ads grew larger, and the spotlight was shone on house brands. This ad also shows how the company pitched the benefits of self-service, as competitors slowly began switching over to the format. The Globe, June 13, 1930. The introduction of one of Loblaws’ oldest house brands. 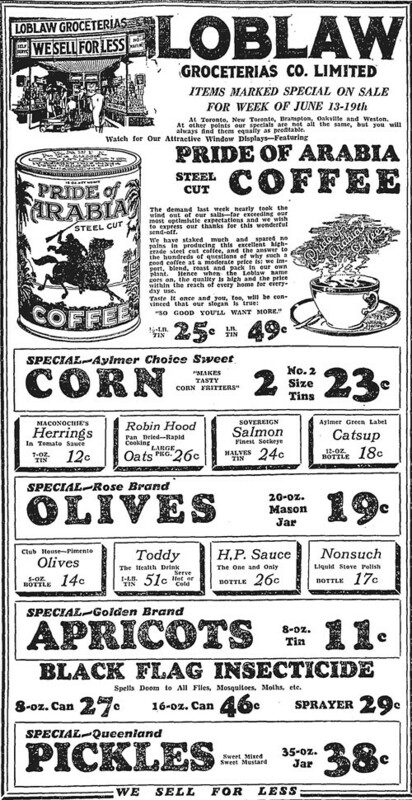 It may be bagged now, but the look of Pride of Arabia coffee has changed little over the past 90 years. The Globe, November 19, 1926. Click on image for larger version. 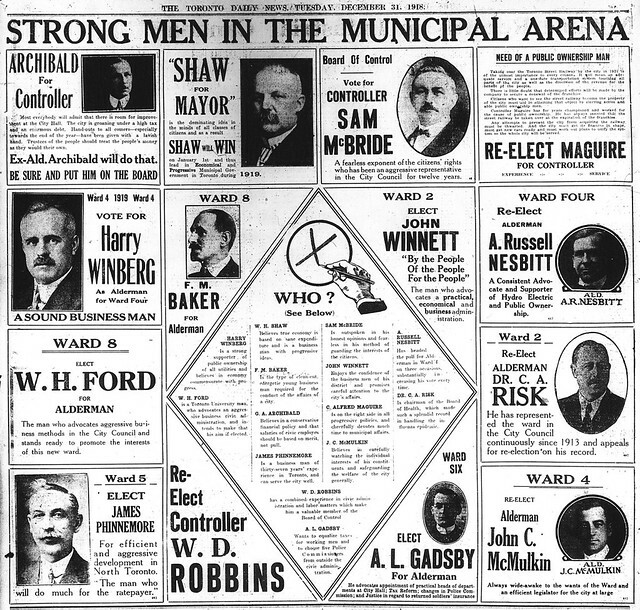 The Globe, November 19, 1926. …while others just seem funny now. Maybe a Loblaws exec who stumbles upon this post might be inspired to launch a new, 100th anniversary artisanal, handcrafted mayonnaise division. The Globe, October 2, 1931. Some chest-thumping as the company opened its 100th location. A condo was recently built on this site. The trade obit for T.P. Loblaw. Read the TVO article, published on January 21, 2019. 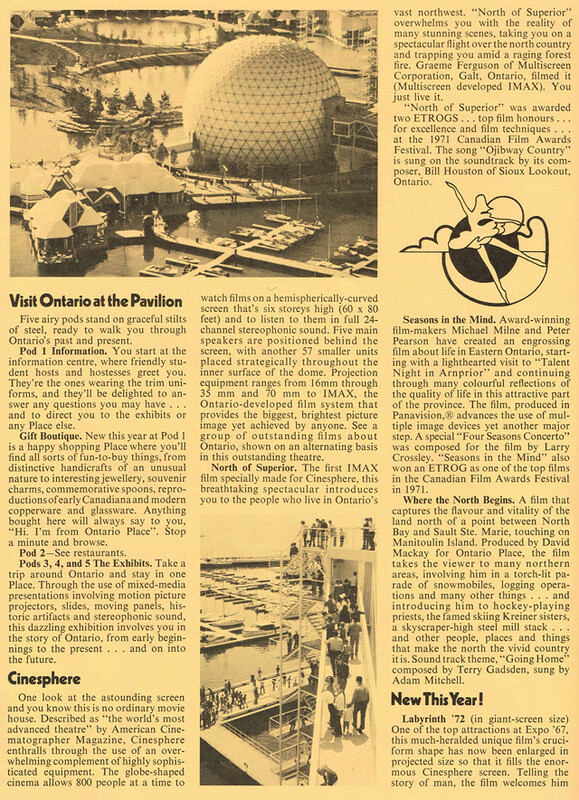 You may also want to read an earlier piece I wrote for Torontoist about the opening of the Cinesphere. His present-day successors in government would be wise to generally revisit that conclusion. The section on the Cinesphere from the magazine, highlighting its second season offerings. The ETROGS (named after Sorel Etrog, who sculpted the award winners received) soon became the Genie Awards, which lasted until they were merged with the Geminis to form the Canadian Screen Awards in 2013. Read the TVO article, originally published on January 24, 2019. The Varsity, October 6, 1965. 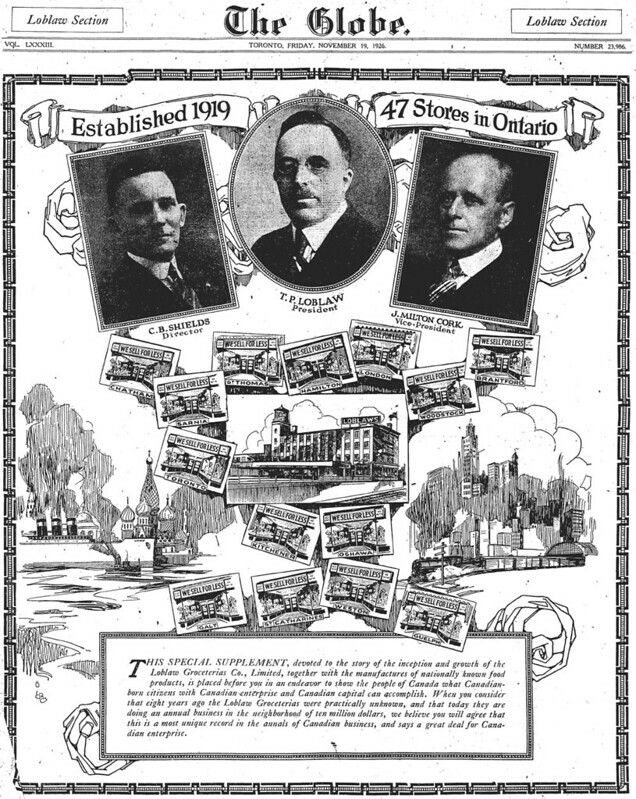 I suspect that when this ad for the Canada Student Loans Plan was published, newspapers were supposed to insert the nearest locations at the bottom. The Varsity decided to let applicants find that out on their own. Confession: trying to sort the financial details of what students could and couldn’t apply for in terms of bursaries, loans, and scholarships under CSLP and POSAP between 1964 and 1967 was confusing, especially as conditions constantly changed. Congratulations to those who figured it out without suffering a nervous breakdown. 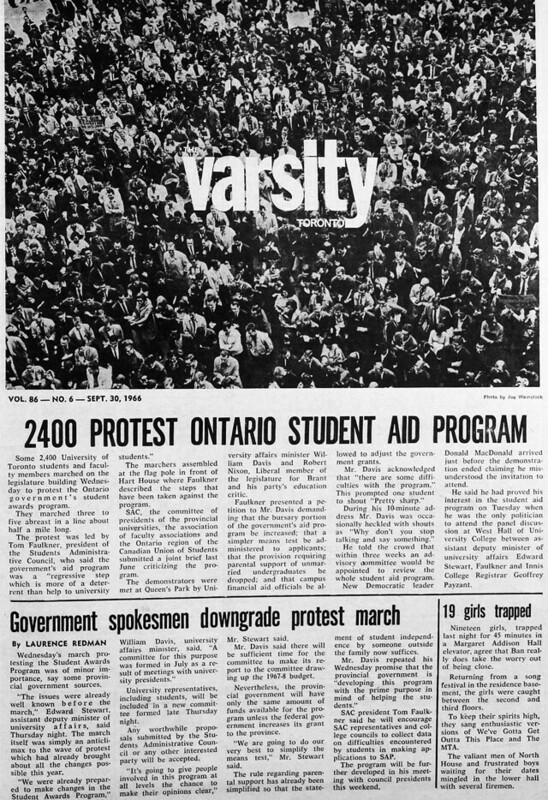 Front page, The Varsity, September 30, 1966. Globe and Mail, September 29, 1966. Queen’s Journal, September 29, 1966. Globe and Mail, August 17, 1967. Author Jamie BradburnPosted on January 24, 2019 January 24, 2019 Categories UncategorizedTags 1910s, 1920s, 1930s, 1960s, 1970s, cinesphere, cslp, education, film, grocery, loblaw groceterias, loblaws, magazines, ontario, ontario place, osap, posap, protests, retail, student loans, supermarkets, theodore pringle loblaw, universities, university of toronto, william davisLeave a comment on Bonus Features: Loblaws, Cinesphere, and OSAP, Oh My!